The Danskin Now Women's Knit Slip-on Shoe is a must-have for fashionable comfort. Featuring a comfortable sole and round toe, it offers support while still looking stylish. The fabric is a mesh upper that provides mobility and breathability. Pair this Danskin Now shoe with your favorite yoga pants for a casual look. It comes in gray, pink, black and white, allowing you to match your look smoothly. This shoe features an easy, slip-on style and comes with a memory foam interior that delivers comfortable support. I've been wearing them for two years almost daily and they just started to fray so I bought two more pairs. Please Danskin never stop making these shoes! They're great for walking, tidy enough for workplace casual, totally silent so you can sneak up on co-workers like a ninja, non-slip sole, easily removable/washable cushy insole which has not flattened at all in two years of wear; I cannot sing the praises loudly enough. 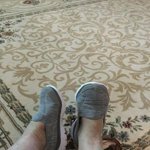 Ladies, if you have achy or problem feet, I can almost guarantee you will love these shoes. Danskin now memory foam are the best shoe ever. I have problem feet with bunions, hammer toe and these are pretty much the only shoes I can wear! I havent even found a slipper that compares to these. Now Danskin has come out with a new style that say theyâre wide but the fabric doesnât stretch! PLEASE DANSKIN BRING THESE OLD STYLE BACK! They wash nicely as well. I have 3 pair and hope that they last long enough until I can have surgery or that Danskin realizes the HUGE MISTAKE they made in changing the fabric! They must see that the sales are not there like they used to be. I have had the same pair of slip on shoes for several years and it became clear that they were not going to make it through another northern WI winter. But I loved them so, the search was on. Shopping online, these looked and sounded like the closest to those I had so I ordered them. They are VERY close and now I love them. I also know I'm ready for another winter with COMFORTABLE slip on shoes. You can't beat these shoes for the money that are comparable to another famous brand that charges at least 4x the amount of the cost of these shoes from WM. I have them in gray and now black. I would love to see them offer more colors. Quality is good for what you pay. I normally wear a woman's size 12 but tried a size 11 on anyway. I was surprised they fit and felt so comfy so I bought a 2nd pair in black. I didn't try on the black pair in the store and was really shocked when I got home and they were too big. I wore the grey pair to work and got quite a few compliments on them and they were really comfy. I am a teacher's aide so I am on my feet and walking most of the day. I ended up exchanging the black pair for another pair of 11s that fit fine and also got pink, lt blue and a 2nd pair of grey. I tried all these on in store and found that of 2 different pairs of grey, one was perfect and the other was too big. I recommend these shoes but I recommend trying them on before purchase! I am considering buying another pair of black. I will most likely wear the grey and black the most and I don't want to be without these shoes. I can wear them with skirts and dress pants and they look fine and my feet do not ache from wear dress shoes all day. Not the best in comfort but at this price they work. Super comfy at first but they tend to lose the softness quickly. Ok for a few hour work shift if you work on your feet the entire shift, you will still be hurting at the end with these. Sometimes my feet end up hurting, pretty badly, after a few hours on my feet. It's usually in my heals, as I had a prior bout of plantar fasciitis. I bought these to use as slip ons, when running my girls to and from school, as I usually just throw on flip flops, even if there is snow on the ground. Well, that always leaves my feet getting either cold or wet. I recently purchased these online to use in the fall when school started. We just took a trip to Vegas and when I was packing, I saw these in my closet and thought it would be a great way to test them out. I bought the black pair and wore them without socks, to the airport, paired with a black tank top and white shorts. They looked super cute. They were VERY comfortable and didn't leave my feet stinky, at the end of the day (because of no socks). Another day in Vegas, we ended up spending the day walking around the strip. 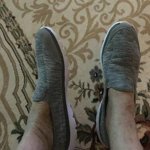 These kept my feet pretty cool (considering it was 115 degrees), as they have little mesh breathing strips, on the top of the shoe, that allows the foot to breathe and the foot not to get sweaty. The inside of the shoe is fitted with light memory foam and this kept my feet nice and comfy as we walked around. It's not a thick feeling, in the shoe, like I was worried about. Just the right amount of padding. At the end of two days, the shoes did look a little worn, but for $12 what can you expect? They are great quality, but if I wore them every day, I don't believe they would last long. The soles did not have much wear, after even two days, so the soles are very durable. This is a great shoe! I would of put zero for the stars but its not an option! These are TERRIBLE compared to the other older style of fabric. They say theyâre wide like the other style but they hurt my bunions and cannot wear them. PLEASE BRING BACK THE OTHER SOFTER FABRIC THAT STRETCHED! ð The picture shows me wearing the older more comfotable style. Insoles slipped out while walking! I got these for work because when I tried them on they were cushy and comfy. 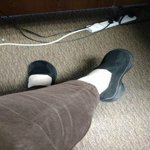 As soon as I got out of the car that morning wearing them and started across the parking lot, the memory foam insoles started slipping up and out of the backs of the shoes! Apparently the pair was defective or something because there were only a few small strips of glue on them and it was dried out. I had to wear them without the memory foam all day at work walking on the cardboard. Would hot glue them back in but the size ended up being too big anyway as well so they're like flops. I kept the receipt. I was looking forward to these shoes having paid over $13 (black) for an inexpensive pair of shoes without trying them on first, I thought they'd be ok according to all the good customer reviews. I put them on and realized the left shoe was very tight and uncomfortable. Holding them up beside each other, it was visibly shorter than the right shoe. To top it off, looks like the insole in the left shoe (since that shoe was not the correct match to the right) was squished into the it and its all waded up in the heel. I wear a 7 medium and ordered the 7.5 medium. Also, keep in mind, these shoes are more for wearing in the gym, exercise mat, yoga. They have sole that has almost a felt type finish and attracts dust and hair. I wouldn't advise wearing out doors. Unfortunately, I can't suggest them at all. I'll have to make a special trip to the Walmart to get a refund and no doubt, this time of year, stand in a long line.